A few days ago rapper Drake was reported to be leaving his management team Hip Hop Since 1978. This came as a huge surprise amidst Drake's incredibly successful career and latest album. 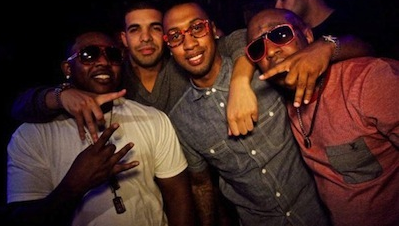 Drake who is signed by Young Money is managed also by the same team behind his peers Wayne, Nicki, and Kanye West. The internet is going crazy over such an idea, because from the outside looking in it doesnt quite make sense. Well, I guess the rumor mill got way out of hand, as Cash Money's CEO had to address it. He tweeted out a link to a post on Drake's blog that basically shut the rumor down! Some blog sites are starting to spread this rumor just for attention. The rumor states that Drizzy has fired managers Gee Roberson, Al Branch, Kyambo Joshua and Bryant Cortez of Hip Hop Since 1978. These four managers also manage Lil Wayne, Kanye West, Nicki Minaj. Firing management after getting a number 1 album and 650,000 record sales in a week? THIS IS NOT TRUE.